Home » Blog » Your Policy Training Stinks! Try Something Better. This is the first article in our ongoing series focusing on real-world case study projects. Each month we’ll look at a project from 2 perspectives: an Instructional Designer / Developer and a Manager / Program Administrator. Each article will highlight what you can take away from the project, to use in your own work. This first article looks at new employee onboarding we did for a local Park District. In particular, we’ll discuss how to deliver better policy training to your employees. 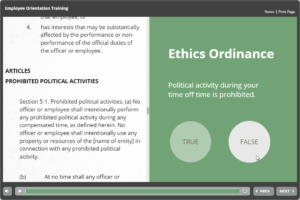 We’ve talked before about optimizing the onboarding process, but today’s article is specifically about policy training. The first problem with most policy training courses is, you guessed it, they’re boring! And unfortunately for new employees, they’re often faced with lots of bad policy-related training when they start. Poor onboarding sets the wrong tone for your new employees. It also inhibits the effectiveness of the learning experience. Let’s face it, when your required training stinks, all your employees know it. They often sympathize with new employees (or make fun of them) because of the brutal experience they are about to encounter. This “rite of passage” only serves to undermine your training. It also lets your new employees know that nobody actually takes your training very seriously. So how do we fix it? Well for starters, the training needs to be relevant. To whatever degree you can segment the training and only make people take what pertains to them, the more they can focus on what really matters. Even for content that is applicable across the organization, scenarios can be a great way to deliver this type of information in a way that is impactful and engaging. Portraying employees in teachable moments can really help to drive home your message in a way new employees will remember. Can Policy Courses Have Too Many Policies? One of the other problems with so many policy training courses, is that they’re littered with policies. Slide-after-slide and bullet-after-bullet, listing all the policies. Or on the flip side, the employee is given a copy of the policies (could be a hard copy, or a disk, or an intranet link) that they are “expected” to take home and read, then sign an acknowledgement saying that they’re familiar with the policies. In all seriousness, do you think anyone has actually read the policy manual? And for the odd person that possibly did, do you think they retained any of it? Of course not. Let’s face it, most employees don’t care about any of the policies (and thus they won’t remember much, if anything about them) until they impact their job or personal lives. For example, most new employees don’t want to sit through a day-one orientation about insurance benefits, when they aren’t eligible for health insurance until they’ve been employed for 90 days. They care about these details when it’s time for them to make a decision. Now, this doesn’t mean we should abandon day-one onboarding courses, obviously. But we should rethink what / how we’re training the new employee. First and foremost, we need to re-evaluate what we actually expect new employees to remember and be able to do after the training. Specific job-related policies may be things you actually need employees to remember and act on regularly within their jobs. For all the other once in a blue moon policies thrown at employees, it’s better to take the “teach a man to fish” approach. So, what does that really mean? Well, for any policies that you don’t REALLY expect people to memorize, wouldn’t it be better to teach them how to find and apply the policy when they need it, rather than tell them about it now, knowing they’ll have forgotten it moments from now? The way we handled this in the Park District’s course was to embed segments of the policy documents right into the course. This solved a few previous problems. First, they knew the employees were actually exposed to the policy docs within the course. This way they didn’t have to rely on new employees “reviewing the policies at home” as they had been previously. Second, there was an attestation at the end of the course, which the Park District was able to capture. This served the legal audit requirement of having record that everyone reviewed the policies. But the most significant aspect of this approach was that we paired the policy documents with specific scenario questions. This required the employees to look up the actual policy wording to answer the questions. This approach was far more effective than just listing Dos and Don’ts! It trained employees on where to find the policy documents and how to look up the information they needed. It also forced them to apply particular policies to certain key situations. So, even for people who may not have remembered the specific implications of certain policies, we had trained them to use the policy docs as a tool to answer questions whenever they had them. Ultimately, this made the employees more self-sufficient and lessened the burden on HR having to answer every mundane policy-related question. In our next article, we’ll stick with this same project, but look at it from the program level. We’ll focus on how this new approach changed things for the client, and what the impact of the changes were on the organization.